Atmospheric flow tube-mass spectrometry (AFT-MS) first emerged in 2012 as an ambient vapor sampling technique developed by Ewing et al. and applied to the sensing of trace quantities of RDX molecules clustered with nitrate ions. 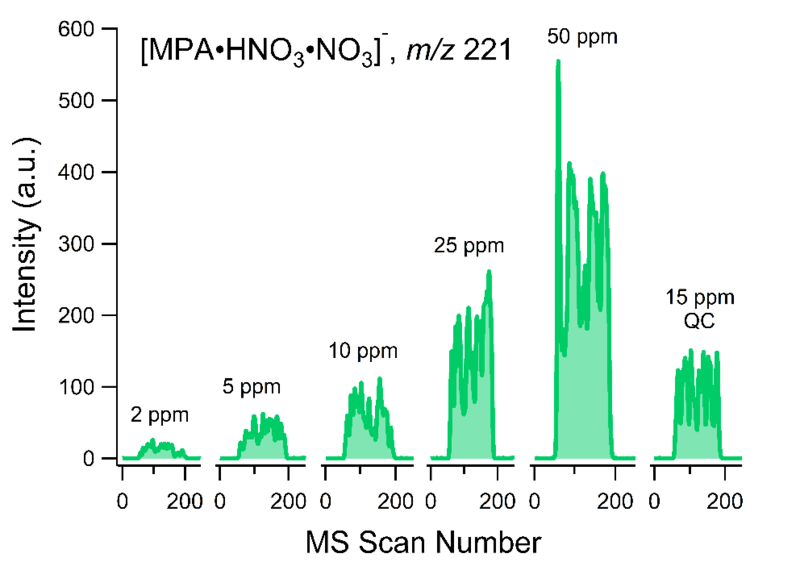 This iteration of AFT-MS used selected-ion monitoring (SIM) during analysis via a triple-quadrupole mass spectrometer and subsequently has been applied to vapor analysis of other explosives adducted with nitrate as well as positively-charged organophosphorus species clustered with amines as proton-bound dimers. Building upon these initial AFT-MS experiments, we have recently applied the atmospheric flow tube ionization method to the detection of alkylphosphonic acids from methanol solution headspace and adducted with nitrate and nitrate-nitric acid species via linear ion trap mass spectrometry. This was performed in an effort not only to demonstrate the application of ion trap MS systems with AFT-MS, but also to characterize the gas-phase ion chemistry of a homologous series of alkylphosphonic acids including methylphosphonic acid (MPA), which is an environmental pollutant and hydrolysis product of some chemical agents. Our article, “Characterization of Alkylphosphonic Acid Vapors Using Atmospheric Flow Tube-Ion Trap Mass Spectrometry,” can be found in Rapid Communications in Mass Spectrometry.